NOT to be outdone is Epilogue, Fablecroft’s anthology of hopeful post-apocalyptic stories which arrived TODAY! Editor Tehani Wessely has presented such a pleasant tactile end to the world with its striking cover and intriguing binary code symbolism. 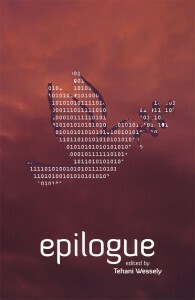 Epilogue is being given away at Goodreads until 8 June. This entry was posted in books, horror and tagged anthology, craig bezant, dark prints press, epilogue, fablecroft, post apocalypse, surviving the apocalypse, surviving the end, world horror convention. Bookmark the permalink.